Today marks the start of National Hispanic Heritage Month, which runs from September 15-October 15. 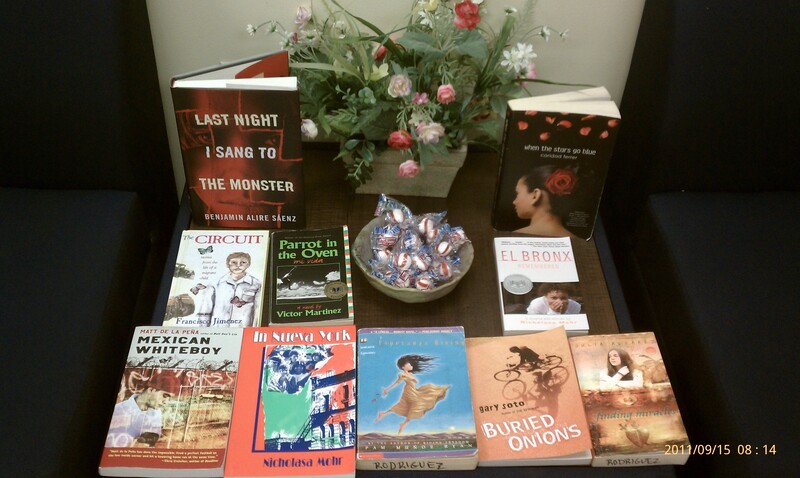 To celebrate, I set up a book display in my classroom and invited my colleagues to read an Hispanic author this month. 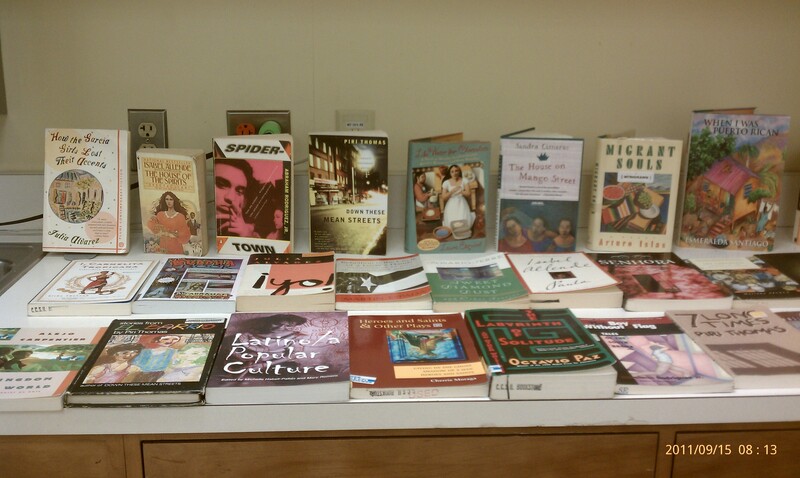 So far, no takers, but my school librarian did vow to order more books my Hispanic authors, which was great. And here’s a link for Latina Book Club, a site by Maria Ferrer dedicated to promoting Hispanic authors and literacy. And, today’s YA author in the spotlight is VICTOR MARTINEZ. Enjoy! AUTHOR: (Most of this information came from the HarperCollins website) Victor Martinez, a Mexican-American poet and author, was born and raised in Fresno, California, the fourth in a family of twelve children. He attended California State University at Fresno and Stanford University, and has worked as a field laborer, welder, truck driver, firefighter, teacher, and office clerk. His poems, short stories, and essays have appeared in journals and anthologies. A week before he was nominated for the National Book Award, he read his poetry in public. Six people showed up. Three were his friends. After he won, he was interviewed by national media and his novel made its way into high school curriculums. The $10,000 prize was more than he had made the previous year. Martinez died on Feb. 18, 2011 a few days before his 57th birthday. This was Martinez’s debut novel and only YA title. He won the 1996 National Book Award for Young People’s Literature and the Pura Belpre´Award. The novel was also listed on the Boston Globe-Horn Book Fanfare Honor List and Publisher’s Weekly Best Book of 1996. Fourteen-year-old Manny Hernandez wants to be more than just a penny. He wants to be a vato firme, the kind of guy people respect. But that’s not easy when your father is abusive, your brother can’t hold a job, and your mother scrubs the house as if she can wash her troubles away. In Manny’s neighborhood, the way to get respect is to be in a gang. But Manny’s not sure that joining a gang is the solution. Because, after all, it’s his life–and he wants to be the one to decide what happens to it. The novel’s format and style received some criticism from readers on Goodreads, but I liked both aspects. Manny’s voice is consistently poetic, so I accepted these beautifully written passages as part of the main character’s thought process, even though he is only 14. At times, while reading YA novels, I stop and think, “No teen-ager I know has ever used that word or would ever say that.” But in this case, I didn’t question the narrator’s observations. The writing pulled me in; I believed it was Manny’s voice. As for the vignettes, they were related and chronological for those needing to connect the plot’s dots. 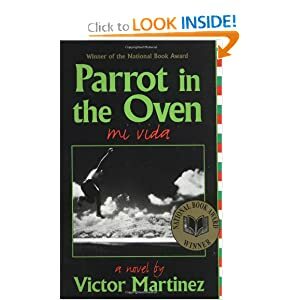 Find PARROT IN THE OVEN: MI VIDA on Amazon.com and Goodreads.